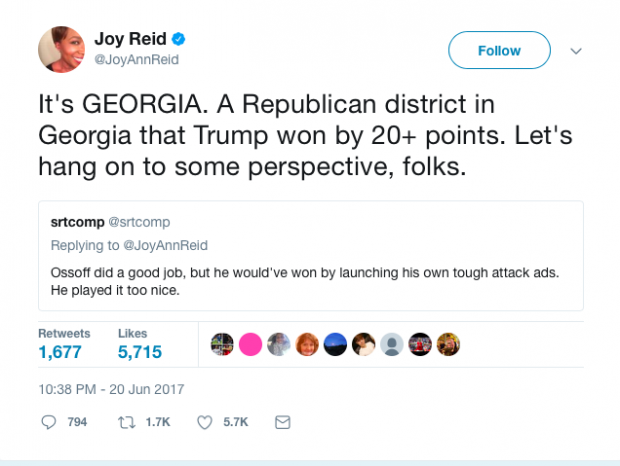 MSNBC host Joy Ann Reid falsely claimed Tuesday night that Donald Trump won the sixth district in Georgia by 20 points — he only won by one. However, the tweet, which had thousands of retweets and likes before she deleted it Wednesday morning, was blatantly false. Donald Trump actually only carried GA-06 by one point. Reid was probably thinking of Rep. Tom Price’s victory in the district back in 2016. Price, who was the incumbent at the time, won by over 23 percentage points. The special election was held to replace Price, as he was nominated to serve as Trump’s secretary of health and human services. It took Reid almost a full 12 hours to delete the tweet, even as people informed her of mistake.